In the Danish city of Aarhus, Lani Holmberg puts her nose to the ground, sniffing out the best of the entertainment at one of Scandinavia’s biggest festivals. Imagine you’re a character in an Alfred Hitchcock movie. You’re running through an abandoned metal factory in the middle of the night. Around you shadows jump and your heart beats faster as a sinister figure draws terrifyingly closer. Now imagine the soundtrack for this scene. Hear the screeching, spooky, industrial score as it plucks at the hairs on the back of your neck? It’s about 9pm, and that haunting soundtrack is echoing across rooftops in the Danish city of Aarhus, as if a train has derailed in the heart of town. I follow the sound as it reverberates through the crowded streets, eventually stumbling upon a huge double-storey pentagonal construction erected in the square next to Aarhus Cathedral. Made from 10 stacked shipping containers, the contraption is a giant musical instrument, with a 50-strong audience tucked inside its belly. Ten energetic musicians use violin bows, saws and karabiners to play piano strings strung taut between both ends of each container. Lit brightly against the inky night sky, they focus on a conductor standing amid the audience. His nostrils flare and hands fly as he sends the unique psycho symphony vibrating down through the containers, engulfing the crowd sitting spellbound below. Some audience members close their eyes, surrendering to the experience. 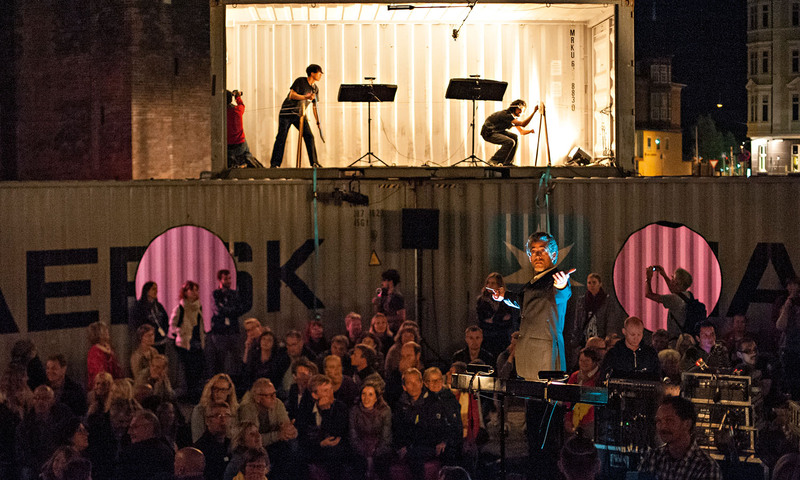 My eyes dart back and forth between each container, mesmerised by the musicians’ movements. With the dips and sways of the music, they climb the container walls to create a sound that is as harmonious as it is discordant. At the end of the 45-minute performance I jump to my feet, swept up in a standing ovation. We’ve experienced the magic of Huey Mecatl, a Mexican instrument-invention that’s a highlight of the Aarhus Festival. Each year, Copenhagen’s sleepy little sister dusts off her dancing shoes for one of Scandinavia’s largest events, a 10-day music and cultural celebration that grips the city streets. Locals hold the event in high esteem. At least that’s my assumption based on the number of Danes insisting it’s a must-do experience during my six-month visit. I’ve dutifully trawled the program and filled my diary with an ambitious, scribbled itinerary set to take me all over town. Denmark can be bothersome for the bank balance, but I’m delighted to discover the line-up is full of free entertainment and shows for less than US$10. That said, some of the more expensive ticketed theatre, dance and music events are difficult to turn down. Two excellent international acts – Beth Orton and the Walkmen – are among the many musicians to take to the stage. The food festival also tempts. Here, local growers and chefs gather with gastronomes to celebrate the famed Nordic approach to food in balance with nature. My first festival foray is far from what I’d envisaged. The concert isn’t my cup of tea, then I get lost on my bike trying to make it to my second show. By the time I return to the town centre for my third calendar entry I’m confronted by huge crowds gathering along the canal ready to party. I abandon the rest of my plans for the night, skip the crowds and wander around the old part of town, disheartened but open to serendipity. Gradually the festival reveals her true self. Like a mischievous friend with a twinkling eye, she knows exactly what I need. She takes me by the hand and shows me what the festival is really about: spontaneity, happenstance and cosiness. The next afternoon I climb steep stairs to a loft in the cultural precinct of Godsbanen, where, in darkness, I dance with strangers for hours. At sunset on another day I link up with a peloton for the people and cycle through town spreading smiles to onlookers. Between bands, strangers link arms in the main square and swing dance to Benny Goodman tunes that spill from the speakers. Later in the week, as the evening chill envelops the city, the now-familiar rowdy crowds again gather, attracted to the canal as though it’s filled with free-flowing beer. This time I hightail it to the atmospheric streets of the Latin Quarter. Desktop research couldn’t have helped me find the live music scene popping up curbside in this part of town – there’s simply no program for it. The thrill of the unexpected has me prowling the streets like an explorer in this ancient Viking town. When my feet grow tired at the end of long days and nights, I make a stop at the grassed urban space in front of Cafe Le Coq on Graven or one of the bars in the little streets nearby. Sipping wine and sitting shoulder to shoulder with other festival folk, I soak up the collective warmth. I’ve found my festival groove. Despite the impending grey of winter, I’ve noticed a romantic cosiness in Denmark. There’s actually a special word for it: hygge. It’s tricky to pronounce and it seems everyone has a different translation to offer when I ask. But taking what I can from various explanations, it refers to that comfortable, snuggle-by-the-fire feeling you get with a glass of red and good company. Cosy as a direct translation doesn’t seem to cut the mustard; hygge is also a state of mind and a feeling or intimacy between people. If I have the translation correct, it seems much of the Aarhus Festival magic is about creating hygge in different ways. At an outdoor concert a stranger smiles and shares a blanket with me to keep warm against the autumn chill. At the Turkish Tent, I sit with friends on carpets sipping sweet tea while young and old swirl and clap around us. There is a commonly held belief that Danes can be rude, but the festival doesn’t reveal this. Many locals strike up a conversation and warmly welcome me to their city. The streets are alive but they are also inclusive. I feel a part of the celebrations rather than a tourist standing on the periphery. My expat friends, too, return from the festival feeling far more connected with their adopted home. It’s given us an excuse to venture out and discover what really makes Aarhus tick behind the cute, coloured houses. We share stories of treasure hunting, a peculiar light show projected around the grounds of an old mansion, a mobile bike cinema and a flash-mob dance in front of the Aarhus Domkirke, the city’s cathedral. Aarhus has surprised us. KLM flies from most Australian capital cities to Copenhagen. From Copenhagen, SAS flies to Aarhus. There are also train and bus services. Step back in time and rent one of two tiny eighteenth-century houses in Møllestien, the most picturesque lane in Aarhus. Prices start at about US$120 a night. The Aarhus Festival takes place during the end of August and beginning of September each year. Each the website for specific dates. To discover more about Aarhus visit its tourism website.